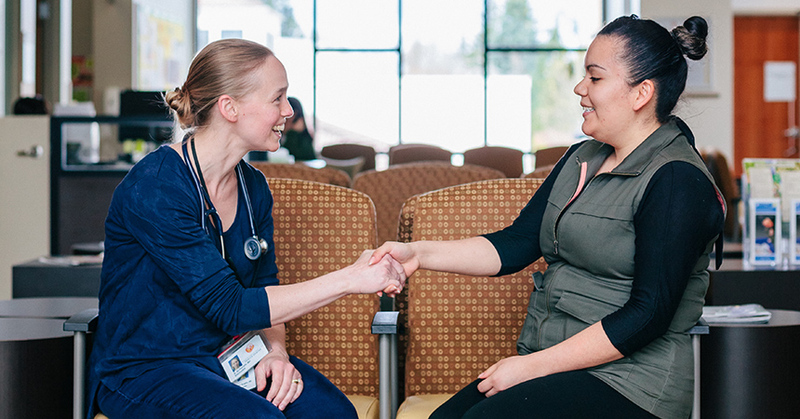 With 17 clinics across Washington and Yamhill counties, Virginia Garcia Memorial Health Center provides high-quality, comprehensive and culturally appropriate primary health care with a special emphasis on migrant and seasonal farmworkers and others with barriers to receiving health care. When an opportunity opened to build a new clinic in Cornelius, the nonprofit focused on a patient-centered design, emphasizing health, wellness, the environment and community. The 35,000-square-foot, LEED® Silver certified Virginia Garcia Wellness Center in Cornelius facilitates a sense of well-being. It is bathed in light from a 20-foot-high skylight that illuminates two floors and double-height windows that overlook the front and back entries. The center boasts multipurpose spaces for classes and community use, including a kitchen, exercise room and community garden. Virginia Garcia worked with Energy Trust to integrate extra insulation, high-performance windows, efficient lighting and controls, and a variable-refrigerant-volume conditioning system to keep energy use low and comfort high. The center uses 30 percent less energy than a typical building constructed to Oregon energy code and is outfitted so the roof and electrical system are ready for solar panels when funds permit.